You are here: Home / When to Djinn Lock? Hey everybody! I hope you guys are as excited for the Forbidden and Limited List as I am! This is perhaps the most important list of the year as it is the list that will be used to qualify duelists for the 2015 World Championship! I hope we can all rejoice in the limitation of certain floodgates; specifically Vanity’s Emptiness, a card that has consistently been thought would surely be hit on the next list, only to consistently remain untouched. Combine this with the hit on Skill Drain and I predict the result is that Nekroz will become even more dominant than they were the previous format. It’s similar to the two Dragon Ruler formats, where even though all of the baby Dragons and Super Rejuvenation were banned, they still became even more powerful, relative to the other decks in the format. I think that this will be much the same and other decks that were powerful, like Qliphort, won’t be able to keep up with Nekroz without the floodgates. Nekroz, however, come with their own floodgate; Djinn, Releaser of Rituals. Ignoring the obvious jokes, I’m going to tackle a question that it seems like not many people are talking about, despite how big of a role it plays in the format; when do you Djinn lock? While the answer “when you have it in your deck and your opponent does not” may be applicable, are there any reasons you wouldn’t want to Djinn lock your opponent? At the Circuit Series in Hartford a couple of weeks ago, Ben and I played a build that played multiple Armageddon Knight. While I just missed out of Top 16 by going x-2, Ben ended up winning the entire tournament. Despite the increased access to Djinn through Armageddon Knight and, by extension, Reinforcement of the Army, we came to the conclusion that it was rarely correct to put your opponent in the Djinn lock. Why? What are the most common ways the Djinn lock is broken? While we also used Armageddon Knight to out the Djinn lock, the most common ways to out it are Book of Eclipse, Book of Moon, and Raigeki. What happens if they do break your Djinn lock and they’re also playing Nekroz? Well, that would largely depend on what type of Djinn lock you make. The most ideal turn 1 Djinn lock is generally regarded as the one that ends with Clausolas and 5 cards in hand. While it certainly takes a strong hand to do this (4 combo cards), let’s take a look at what happens when it is broken. Your opponent starts off with 6 cards, we’ll assume one of them is a Book of Eclipse that was used to break your lock. With their remaining 5 cards, they are usually able to do whatever they want unopposed. The prime candidate? Trishula. They’ll banish your in grave Cycle that you used to grab Clausolas, the Clausolas itself, and one of your 5 cards in hand. The only way for you to have made this play in the first place is to have used Senju or Manju and Unicore with Kaleidoscope sending Herald, summon Valkyrus using Mirror on Shruit, make Lavalval Chain to send Djinn, tribute Lavalval Chain to draw 2, search for 2 Ritual spells by banishing the in grave Ritual Spells, then using Cycle to revive Clausolas. This means that you’ll still have a ritual spell as 1 of your 5 in hand since you searched 2 ritual spells, but had used them all but Cycle already that turn. That means you’re going to be drawing to 5 cards in hand and no ritual spells in the grave. Since what your opponent is going to do depends on how limited they are by their hand, let’s look at some of the most common outcomes. The first scenario involves them having put you back under their Djinn lock when they summoned Trishula. If they opened Senju or Manju there’s a good chance that they can and will do this. For you to win here, one of your five cards needs to be an out to their Djinn lock and then you still have to have a good enough hand at that point to be able to Trishula them back. Even if that happens, you don’t have any checks on stopping them from playing, so the game will just continue and you still have to actually win the game, now with only 2 Ritual Spells (aka number of times you can summon in the duel) left. The second scenario is that instead of putting you under Djinn lock, they summon Valkyrus and just clear their field altogether. It’s pretty much impossible to actually win the game at this point, because you’ll never be able to do 8000 damage with only three ritual spells left in your deck. They’ll be able to loop Valkyrus back to their hand more times than you will be able to ritual summon monsters, since you’re going to still have to clear your field every turn to avoid them being able to Trishula you again. You’re almost certainly not going to win if they do hit the 1/5 ritual spell off their initial Trishula hit, as you’d have to win the game with only 2 ritual spells in your deck and none in grave (and likely 0 in hand). Djinn also doesn’t really follow the idea that “it gets better as the game goes longer since your opponent will have fewer resources to deal with it. ” This holds true for some things as the opponent will have to spend resources to deal with different situations, but Djinn isn’t one of these scenarios, because they won’t ever have to spend their Book of Eclipse. Not only will they not have to, they outright won’t be able to as there will never be a monster left face up to use it on and if they set it, they risk get Trishulad. This means that if they ever have Book of Eclipse or any other out, they’re going to still have it in hand whenever you do decide to Djinn lock them. Thus, using Djinn later in the game only serves to increase the chances that they have drawn the out as the game continued to progress. Just about the only time that you’re going to have a chance of winning the game is if they leave their Trishula on the field without having put you back in a Djinn lock and then you still have the resources available to Trishula them back. This is extremely unlikely, especially when you consider the fact that on top of a subpar hand, it also assumes that they will play poorly. Even if the game continues for a couple of turns after they break the Djinn lock, it’s almost never going to result in you still winning the game. It’s not too much of an overgeneralization to say that if they can’t break the Djinn lock, you’ll auto win, but if they can break the Djinn lock, they’ll auto win. I’d like to point out that up until this point, we’ve only been talking about the hypothetical results for the ideal Djinn lock. Every other Djinn lock is strictly worse than this one. Breaking this one almost always results in you losing the game, so logic would dictate that every other variation of the lock that doesn’t end with Clausolas and five cards in hand, will be even more unlikely that you will be able to win the game. They all result with fewer cards, which means Trishula is going to hurt that much more when they do out it. Everything that has been talked about so far is amplified by the fact that Preparation of Rights went to 1. It’s now less likely that you’ll be able to reuse a ritual spell once it’s gone as the 3 Unicore (1 of which is gone in the opening play) and the 1 Preparation are the only ways to be able to use extra ritual spells now. That’s all well and good, but I’m still going to go Djinn lock every time if they can only break it 5% of the time. I’ll take those couple of losses in order to win the other 95% of them. So what are the chances that they will actually be able to break it? 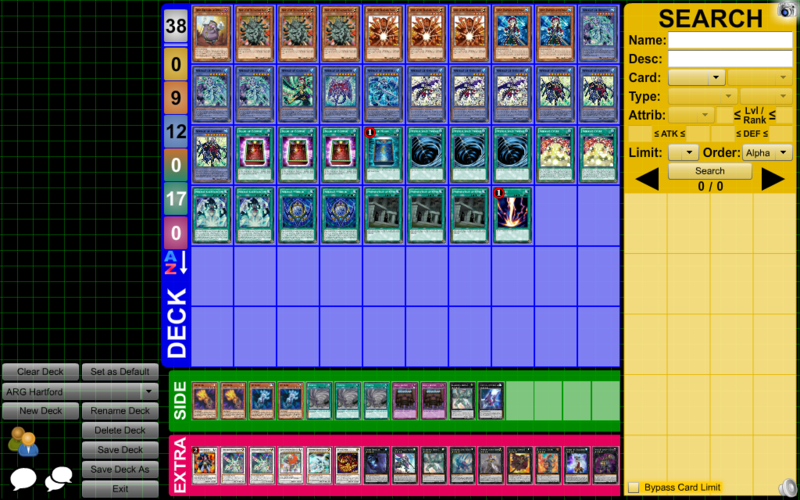 A friend of mine compiled all the data from the most recent Circuit Series and constructed the Nekroz deck that the majority of people played. Click here to look the cards a majority of the Nekroz players who made it to top cut used. The average deck played 5 outs to the lock; 3 Book of Eclipse, 1 Book of Moon, and 1 Raigeki. If you can Djinn lock with Clausolas and 5 cards in hand, you still have a decent shot of winning the game if they out the Djinn lock with Raigeki. It’s still limited by the fact that 3 of your ritual spells are gone, but it’s worth playing since they won’t be able to Trishula you. You are likely to lose if they have any of the other 4 outs and we can calculate the likelihood that they will have one of these outs in their opening hand. To do this, we need to know the number of cards in there deck. This was, however, something that varied quite a bit among the Nekroz decks in top cut. A couple ran the minimum of “37,” a good number of them played 40, and we also saw a few higher variations between 42 and 45 sprinkled in as well. The least likely that they’d have an out is 45 cards; something that will still allow them to out it with one of those four cards 44.80% of the time. As they slim their deck, that number only gets higher. We can generalize this by saying that it’s only marginally better than a coin flip that they will have one of the four cards that will out it and likely result in you losing the game. You’re not going to win any tournament by hoping to flip 13 heads in a row. When you go on to consider that those are the odds that they’ll be able to out it in a 6-card hand, but that they’ll likely be able to survive several turns due to Valkyrus and see additional draws, Djinn locking hardly seems worth it if you’re trying to actually win the tournament. When Would You Want to or Want Not to Djinn Lock? If you’ve got roughly a 50:50 chance between automatically winning the game and automatically losing the game, it seems like Djinn isn’t even worth playing at that point (and certainly not at 2!). We’re trying to maximize our chances of winning the game. This begs the question, are there times where Djinn lock is correct? The way we went about building our deck was by using Forbidden Lance as an out to their out. Any time we could set Forbidden Lance with Djinn, we would, as it’s extremely unlikely that they will be able to out it. They would have to have 2 of the 4 outs (less than 10% chance in a 40 card deck) or have MST and an out together (about 15% in a 40 card deck). However, using Lance at all is much less effective if people begin to use Armageddon Knight and Farfa as Lance doesn’t stop this as an out. If I had a card in my hand that could out their Djinn, I would never go Djinn lock without having Lance in my hand. There’s no need to risk losing the coin toss, when if they Djinn lock me back, they’ll automatically lose the game. If they don’t Djinn lock me, the game continues as normal. Any time you have the out to Djinn, you’re putting yourself at a huge and unnecessary risk if you Djinn lock them. There was another time that we would go Djinn lock as well. The idea that breaking the Djinn lock is the functional equivalent of losing the game is lost on some people. As a matter of fact, it’s lost on a considerable number of people, as there are a good many people that will choose to Djinn lock over Valkyrus plays. Knowing this, if I don’t have an out to their Djinn lock in my hand, I would try to get a read on what I think my opponent will do by attempting to gauge their experience level. If I think they are more experienced, I would choose to not go Djinn lock. If they won’t Djinn lock me, the game will just keep going back and forth, a much-preferred game state to a coin flip. If I don’t think that they are experienced, I would imagine that they will Djinn lock me if they are able to. They will usually be able to Djinn lock me any time they have Senju, Manju, or Djinn in hand. If we assume that they play a 40-card deck, 3 Senju, 3 Manju, and 1 Djinn, they have a 71.44% chance of being able to Djinn lock me. While the chances of them actually winning the game are slightly lower than that because I am able to draw an out over the next couple of turns, even though I don’t have one now, their chances of winning the game by going Djinn lock are significantly higher than the chances that they can out my Djinn lock if I am able to and do it to them first. That 40-card deck of theirs has a 49.25% chance of being able to out my lock. I’ll take my 50% chance at winning the game by them not having an out to my Djinn lock over the roughly 30% chance I have of winning the game if they are able to Djinn lock me any time I think they are less experienced and I don’t have an out to their Djinn in my hand. I would also Djinn lock whenever I can end with 5 cards in hand and have a card like Shared Ride that I could set with it. This would severely limit any kind of follow-up play they might have to breaking my Djinn lock. It’d be difficult for them to be able to Trishula and Djinn lock/Valkyrus to clear their field without giving me plenty of cards to comeback in the process. When these things aren’t happening, I would avoid going Djinn lock even if I am able t(w)o. With YCS Chicago next weekend, it’s important to know how to give yourself the best chances of winning based on the cards that you’re given. I hope to see you all there and remember, play hard or go home! Lol don’t forget your chances also increase when u deceive your opponent, and tell them your siding out a card when in all truth you aren’t. Lmao. ARG does nothing for themselves by continually allowing you to post for them. It reflects poorly on them and honestly, they do not do enough to curb such the disgusting behavior of their sponsored players. It’s over Hoban, you blew it. All of your titles count for nothing now, you had a shot and you decided to play dirty and you got caught. It’s all just garbage now. The right thing to do is to step down. The fact that ARG is STILL publishing your articles does nothing but damage their own reputation. Do the honorable thing and step down Hoban. Your reputation, titles, all of it has become meaningless due to your underhanded actions. LMAO. Haters seem a little buttfrustated. SWAGtrick PROban still drippin swagoo. I wonder, now that this information is out, how you will respond, given that people will respond in an expected way. It seems that nekroz, like other decks that use low amounts of backrow, are, as you said, a ‘bigger’ deck type. I think that an aggressive build is the best one, not necessarily an otk type, but one that uses less defensive cards. A pressuring type rather than otherwise. I wonder if using something like recklesses could allow for bigger plays and get those outs and needed setup components faster. If that big play is possible to be made. Also, if it is the case, then I wonder how the side would go, as they could be taken out if the opponent decides to use decree. I think the banlist was good (wished they kept emp, as I like it) especially on the skill drain. Making nekroz the main competitive deck with the list is I think, what will happen. Which is good, as I don’t run meta anyways. If one uses a high number of cards that floodgates nekroz (grave of the superancient organism, emptiness, jowgen, fossil dyna) as well as stall to protect them (around 10+), then a consistent 1st turn lock can be established. With that done, if the win condition is condensed in a few cards, one can have a consistent floodgate deck with the win condition to eb used later on when it is needed, and not in the opening, which would be a dead card as the lock was not yet established. That, I think, is a good antimeta strategy that I’ve used thus far. However, in the beginning of the format, I think people would use other stuff at first, before tiers are established, and a more dominant deck is seem by most players as the good one. Therefore, I’ll wait for now. And eat popcorn. Maybe. Duh! you lock after you get your opponent to side it out!